Aremarkable one-of-a-kind museum that displays the late Sheikh Zayed's most personal and valuable belongings, can now be seen by the public for the first time, to celebrate the nations history and to honour the Founding Father of the UAE. Majlis Zayed: The Museum, on the 90th floor in the tallest tower in Abu Dhabi, Burj Mohammed Bin Rashid, coincides with the dawn of the Year of Zayed 2018. As visitors walk through the stunning hall, they are embraced with natural light that fills the entire room from floor to ceiling. Upon entry, visitors will witness first-hand some of the most cherished items that belonged to the late Father of the Nation. Around 100 items are on display, including larger-than-life paintings and portraits of Sheikh Zayed, historical photographs, early pictures of Abu Dhabi, revealing how the Capital looked like, long before the City blossomed into the hub of modernity and technology that it is today. The museum also displays his private club car as well as chairs, golden and crystal chandeliers, flags, clothing items, falcon statues, and enormous bronze vases. Pictures on display include a photograph of the traditional celebrations in Abu Dhabi during the mid-1980s, a picture of one of the camel races in the late 1980s, a picture of Al Hosn Palace in the mid-1990s, an image of one of the construction scenes in Abu Dhabi Corniche during the mid-1980s, as well as a picture of one of the major projects in the corniche, taken in the early 1990s. The first picture of the Union, depicting the rulers of the UAE before the emirate of Ras Al Khaimah in 1971, which belongs to photographer Ramesh Shukla, is also on display. 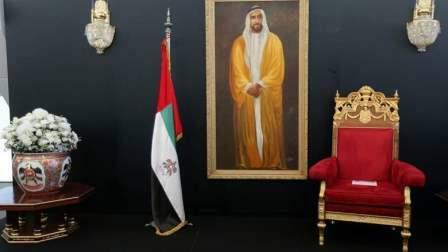 The personal chairs that are on display include the chair Sheikh Zayed sat on during a GCC council meeting in 1986, as well as chairs that belonged to His Highness Sheikh Mohammed bin Zayed Al Nahyan, the Crown Prince of Abu Dhabi and the Deputy Supreme Commander of the UAE Armed Forces, and His Highness Sheikh Mohammed bin Rashid Al Maktoum, Vice-President and Prime Minister of the UAE and Ruler of Dubai. Also on display is Sheikh Zayed's chair that has the first emblem of the emirates on it. An oil painting depicting the Sheikh Zayed and the late Sheikh Shakbout bin Sultan Al Nahyan done by the French artist G.L. Paulet in 1951 is also on display, as well as the very first emblem of the government of Abu Dhabi of the eagle's head, which was made in 1968. Other paintings include an oil painting of the late president by Mustafa Bakeer, painted in 1991. `The first flag of the emirates, which was Sheikh Zayed's private flag, is also on display at the museum. Other treasures include a beautifully decorated and opulent 18 carat gold dagger, which is perfected with pearl and precious stones, including diamonds and rubies. Visitors will also see Sheikh Zayed's desk, which he worked on. The elegant wooden and glass desk is splendidly enriched and decorated in gold.